The impasse in the House will continue for another day. 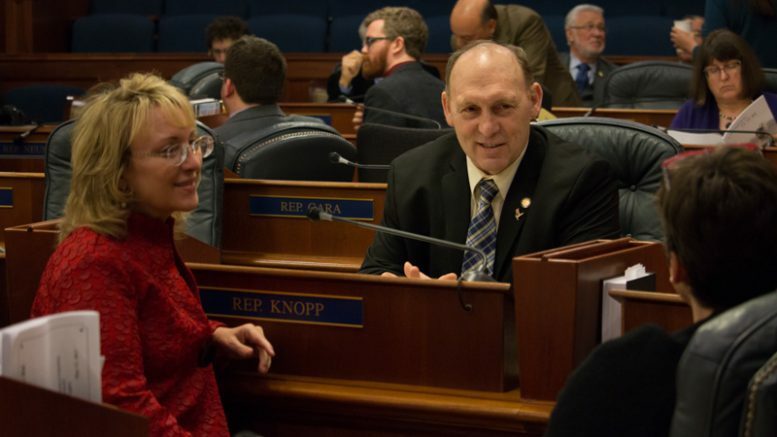 A day after Rep. Gary Knopp, R-Kenai, announced that he had given up on his push for a bipartisan coalition and would support a Republican speaker, he withdrew his support from the majority-Republican caucus and instead supported himself in an apparent last-stand effort to build a coalition. A vote for Rep. Dave Talerico, the Healy Republican favored by the 20-member Republican caucus for a permanent speaker, failed 20-20 without Knopp’s support. Rep. Louise Stutes, one of the two moderate Republicans in the Democrat-led 19-member coalition, put forward Knopp for permanent speaker, making a switch from the caucuses’ pick of Rep. Bryce Edgmon. Rep. Dan Ortiz was the lone member from the coalition to speak in favor of Knopp. Other Republicans asked Knopp for an explanation of his change-of-heart. He said he was approached late last night as a potential alternative to speaker. Though a bipartisan coalition had reportedly been close to a deal on Monday afternoon, with at least four additional Republicans reportedly thinking about crossing over. None materialized in Tuesday’s vote. Instead, multiple Republican members said they couldn’t support Knopp because they said they couldn’t trust him. “This calls into question the ability of this caucus or this group to come together,” said Rep. Mark Neuman, R-Big Lake. The vote for Knopp failed 20-20. The path ahead for the House is unclear. The House adjourned for the day without setting a time, which means it will be due back in session on Wednesday–the same day that Gov. Michael J. Dunleavy is set to release a budget that’ll include massive cuts and proposed changes to Alaska government. Without a permanent speaker, the House will continue to be unable to form committees, introduce bills (including the governor’s budget and associated proposals), hold bill hearings or even finally get their office assignments. Be the first to comment on "Knopp withdraws support from Republican majority, leaving House without permanent speaker"